Khun Warunee, Assistant GM Amari Rincome (third left) in Hannibal Town, USA, as part of the ‘Group Study Exchange’, a Rotary International Project. She was one of only five Thailand representatives, and was the only one who works in the hotel industry - a tribute to the all staff who work in Chiang Mai hotels and often go unnoticed. Khun Jim, the owner of Café Gourmet, pictured here at his recently held party, with Hope, Khemthong, Laura, Dittaya, Celeste, Marji and Nichakorn (l/r). Krit, former owner of Krit’s Pasta, returns to Chiang Mai and opens Krit’s Kitchen on Huey Kaew Road opposite Hillside 4! The menu, Thai food at present, will be extended later. Pictured are James, Joyce, John, Krit, (standing), and Norm, Amnoy and Wan, (seated). The Mayor of Chiang Mai, holding the second of her monthly public forums at the Art Museum. Pictured are. Sudchai Kannakulsoonthorn, consultant to the Mayor, Dr Chao Duangduan na Chiengmai, with the Mayor, Dr Duentemduang na Chiengmai (l/r). 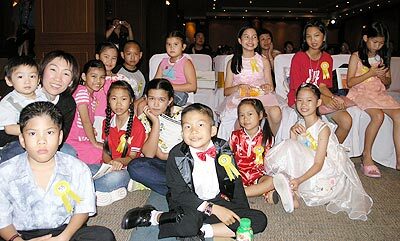 Contestants waiting to go on stage at Chiang Mai School’s 10th annual recital, ‘Showtime - Love Song - Music’. Over 200 local children aged between 5 and 15 performed at the marathon 5 hour concert at the Novotel Hotel on May 25. 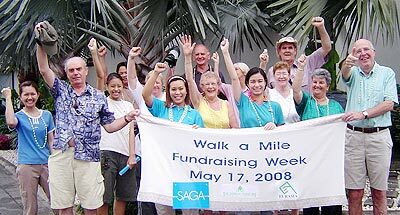 The Saga Charitable Trust arranged a ‘Walk a Mile’ event during their recent fundraising week for aid to developing countries; many of the participants chose to stay at the Imperial Mae Ping Hotel and the Eurasia Hotel whilst in town. 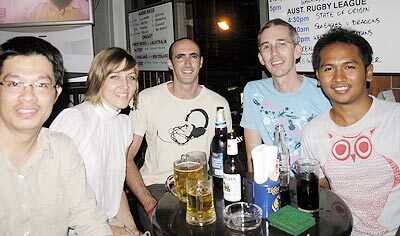 Tum, Mindy, Shaun, Daniel and Mai (l/r) enjoying the music at the UN Irish Pub.